In memory of Shelly Rosenblum. I assisted in the cooking for Passover this year, 2018. I would like to note that, being a Catholic, I have only attended Passover a few times. But I loved Shelly. I would have loved to have had her recipe to work from but instead I had the website of Sadie Salome. Adjusted below to serve the 28 people attending the Rosenblum/Guagliardo passover. For this quantity I used a canning pot. Place the pot over medium-high heat. Add a couple tablespoons of acceptable vegetable oil. Add about half the onion, carrots and sweet potato. Pour on the gefilte fish and it’s liquid. Add the remaining carrots, onions & sweet potato, the dill and the onion skins. Add enough water to barely cover. Raise the heat to bring to bring to a simmer and cook about 2 hours. Remove the gefilte fish and place in a large container (or two). Strain the broth and pour over. At this point you are supposed to save the carrots. Are you kidding me?! What a mess. So I strained off the solids and used the broth to cook another 5 or 6 carrots to serve with the fish. Chill and serve with generous amounts of horseradish. (The Polish side of me can get behind the horseradish). The dill and turmeic combo in this recipe had me skeptical but it turned out to be delicious. The marinated fish gets fried hot and fast in coconut oil. It is served drizzled with a scallion & dill infused oil and served with mango dipping sauce. Combine the marinade ingredients and stir in fish to coat. Marinate the fish for at least 1 hour or up to overnight. Place all ingredients in food processor and blend until desired consistency. Heat 2 Tbsp. coconut oil in a large non-stick frying pan over high heat. When fully hot, add the marinated fish. The fish should sizzle loudly, you may lower the heat to medium-high. Use several batches if necessary to not overcrowd the pan. Do not turn or move fish until you can see the sides turn a golden color, about 5 minutes. Season with a pinch of sea salt. Add more coconut oil if necessary. Once golden, carefully turn the fish over. When cooked, transfer to a platter and keep warm. Heat the pan to medium-high. To the oil in the pan add 2 cups scallions and 2 cups of dill. Turn off the heat. Give them a gentle toss until just wilted, about 15 seconds. Season with sea salt. Pour the infused oil over the fish and serve with mango dipping sauce and additional toppings on the side. For a while it was a “thing” to mimic your favorite prepared foods. Mom tried it out but never really could get behind it, except for this recipe. Mom & Dad LOVED fried food, they were so smart. Mix pancake flour, egg, and seasoning. Add club soda and mix. Dip cod pieces into batter and fry in corn oil until lightly brown. **Mom used corn oil for frying because she liked the taste the best. I’ve tried them all and of course I agree, it’s what I grew up on! From Barefoot Contessa How Easy is That? Place salmon in a roasting pan, season with salt & pepper. Whisk together olive oil and lemon juice, pour over salmon and let stand while you chop the herbs — about 15 minutes. Chop scallions & herbs. Sprinkle over salmon. Pour a little wine around fish. Bake 10-12 minutes, until almost cooked in thickest part. Cover with foil and let rest 5 minutes (more for a bigger piece of fish). I truly dislike salmon, unless the taste is well disguised. This did the trick. Mike thought it was a bit sweet. 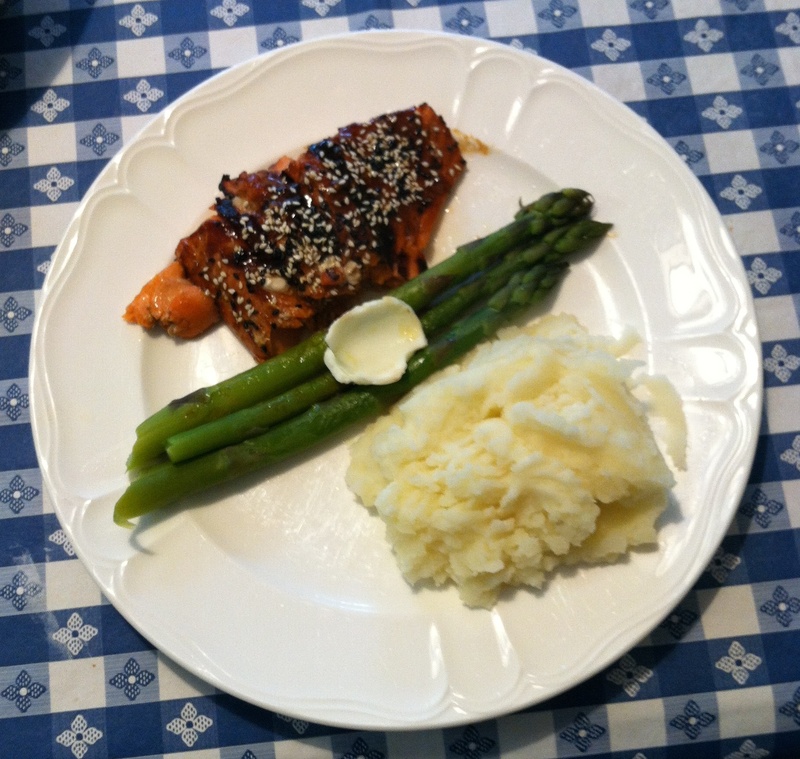 The recipe comes straight from a cookbook we picked up at a yard sale called Simply Salmon by James Peterson. This amount of marinade should be enough for three 6-8 ounce salmon fillets. Season the fillets with salt & pepper and let sit 30 minutes (up to 4 hours) in the fridge. Wipe off the excess salt & pepper. Combine hoisin sauce, garlic, sesame oil and white wine vinegar in a small bowl and spread a generous spoonful of the mix on the fish. Reserve the rest of the marinade. Refrigerate 4-8 hours. Toast the sesame seeds in a heavy skillet over medium heat until fragrant (about 5 minutes). Set aside. Heat the grill. Wipe off the marinade and rub the fish with peanut oil. Oil the grill with a paper towel dipped in the peanut oil. Grill the fish, flesh side down about 3-4 minutes. Turn, coat with remaining marinade and grill until done, approximately 3-4 minutes more. Sprinkle with sesame seeds and serve. Preheat the oven to 450F. Place a piece of parchment paper on a baking sheet or coat with cooking spray. Meanwhile, heat 1 tsp. oil in a small skillet over medium heat. Cook onion and garlic until softened. Add tomatoes, cook about 2 minutes, add olives and capers, stir. Add oregano and vinegar, remove from heat and serve over fish. I had to use up the left over half can of coconut milk from the butternut squash soup, so this is what I came up with. This was inspired by several seafood recipes from Victor Sodsook’s book True Thai. I served this with Jasmine rice. As with all stir fries, this goes quickly so assemble the ingredients before you start cooking. Put the rice on to steam first. In a small bowl, combine chili paste, brown sugar, and tamarina. In another small bowl, combine coconut milk, soy sauce and chicken broth. Heat oil in wok over high heat. Stir fry garlic, ginger, onions, mushrooms and asparagus until crisp tender, about 5 minutes. Add fish, stir-fry another minute. Add chili paste mixture and stir-fry 30 seconds, mixing until sugar dissolves. Add coconut milk mixture, then corn. Stir-fry another minute until all is heated through. Sprinkle generously with chopped fresh cilantro. *Tamarina is a spicy sauce made of tamarind that I purchase in our local Indo-Pak grocery store. I was inspired to add it by a recipe I saw that called for Thai Chili-Tamarind Paste, which I obviously did not have.